Yamaha YFL-221 Intermediate & Standard Model FlutesMemiliki fitur yang sama dengan rancangan kelas tinggi dan perangkaian terhadap model seri 300 dan 400. Flute seri 200 dibuat dari nikel perak yang tahan lama dengan hasil akhir lempengan perak yang menarik. Mereka dikarakteristikan dengan respo..
Yamaha YFL-371 Intermediate & Standard Model FlutesThe headjoint is an important factor in determining the tone. The 300 Series flutes are feature, at a very affordable price, headjoint of 92.5% pure sterling silver, and a nickel silver body and foot for a dark warm tone.FiturCY HeadjointFeaturi..
Yamaha YFL-381 Intermediate & Standard Model FlutesThe headjoint is an important factor in determining the tone. The 300 Series flutes are feature, at a very affordable price, headjoint of 92.5% pure sterling silver, and a nickel silver body and foot for a dark warm tone.CY HeadjointFeaturing a ..
Yamaha YFL-361 Intermediate & Standard Model FlutesThe headjoint is an important factor in determining the tone. The 300 Series flutes are feature, at a very affordable price, headjoint of 92.5% pure sterling silver, and a nickel silver body and foot for a dark warm tone.FiturCY HeadjointFeaturi..
Yamaha YFL-321 Intermediate & Standard Model FlutesThe headjoint is an important factor in determining the tone. 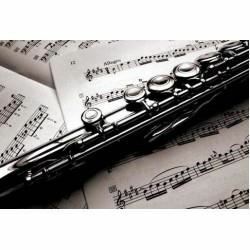 The 300 Series flutes are feature, at a very affordable price, headjoint of 92.5% pure sterling silver, and a nickel silver body and foot for a dark warm tone.FiturCY HeadjointFeaturi..
Yamaha YFL-281 Standard Silver FluteFeaturing the same high-grade design and craftsmanship as the 300 and 400 series models, 200 Series Flutes are made of durable nickel silver with an attractive silver-plate finish. They are characterized by excellent response and intonation. The YFL-281 standard f..
Yamaha YFL-271 FluteFeaturing the same high-grade design and craftsmanship as the 300 and 400 series models, 200 Series Flutes are made of durable nickel silver with an attractive silver-plate finish. They are characterized by excellent response and intonation.FiturCY HeadjointFeaturing a double fla..
Yamaha YFL-211 FluteMemiliki fitur yang sama dengan rancangan kelas tinggi dan perangkaian terhadap model seri 300 dan 400. Flute seri 200 dibuat dari nikel perak yang tahan lama dengan hasil akhir lempengan perak yang menarik. Mereka dikarakteristikan dengan respon luar biasa dan intonasi.FiturCY H..